Hang on, folks, because mobile computing has just got a bit more interesting. Google’s Chrome OS is finally ready for the wild--two years after its launch—and the Samsung Chromebook Series 5, due out on June 15, will be one of two laptops to showcase Google’s Web-based operating system. When Chrome OS was first announced two years ago, I wondered if we really needed another mobile OS. Many of my questions still stand, especially given the runaway success of Android. But after taking the Samsung Chromebook Series 5 for a spin tonight, I was pleasantly surprised to see how far some aspects of the laptop and its OS have come. From the outside, the Chromebook looks like any other ultralight laptop, save for the Google Chrome logo on the outside cover. It measures 11.6 by 8.6 by 0.8 inches, compact, but not especially svelte. Its weight doesn’t impress, either. At 3.3 pounds, it’s no featherweight like the Apple MacBook Air; however, at least the Chromebook felt deceptively lighter than it is, a phenomenon I’d credit to how well-balanced the laptop felt in hand. I was surprised by how easily I could grip the Chromebook in one hand, actually. One of the big selling points of Chromebook is its near-instant-on capability. It starts up in under 10 seconds from a cold boot, and it's ready to use as soon as you open the lid to wake it from sleep. The latter mirrors the sense of immediacy one gets with a Google Android 3.0 tablet, but that cold boot time remains an important differentiator. Android continues to have overhead bottlenecks that cause startup and shutdown times to take some time. None of the Android 3.0 tablets I’ve tested have wowed me with their boot times; and for a couple, I literally was able to grab some iced tea and down half of it before the tablet came to life again. While some of the Chromebook’s startup zippiness has to be credited to the design of Google’s Chrome OS, some of it, perhaps, could be due to the components inside. The Series 5 actually runs components that echo today’s netbooks: It has a 1.66GHz dual-core Intel Atom N570 processor, 2GB of RAM, and a 16GB mSATA SSD (used for caching data locally). Those specs are meatier than what you’ll find in an Android tablet today. Physical connectivity on the Series 5 Chromebook is minimal. All ports along the sides are tucked away beneath covers, except for a lone USB 2.0 port at the far right rear of the laptop. You get an SDHC card slot at front, another USB 2.0 port beneath a cover at the left, a video-out port, and a full-size SIM card slot (on the 3G-capable white and titanium models). The 3.5mm headphone jack doubles as a microphone input as well; and the Chromebook has a 1-megapixel Webcam for video chat. The island-style keyboard felt very roomy and comfortable for my touch-typist fingers. I liked the smooth and roomy trackpad as well; it wasn’t stiff, as I’ve found with other touchpads that double as the mouse buttons. The keyboard swaps out the function keys of yore for a row of browser-friendly keys, though the idea of having navigation buttons like page back, page forward, refresh, and new window situated so far up on the keyboard seems like it may be counterproductive (I’d prefer such keys to be more handily situated, but I’ll need more time with the laptop to tell how well they work in practice). I was encouraged at the Google I/O keynote introducing the Chromebook to hear about the file manager that’s been added to Chromebook. I’ve been tracking the challenges of native file handling in mobile operating systems, and was eager to give this feature a try on Chromebook. My torture test was simple: I pulled out a random USB drive and attached it to the USB port. Chrome OS quickly recognized external storage was attached, and up popped the file manager as another tab in the Chrome browser on-screen. I was able to view my folders and files, select a file, preview the image in a pane at right, or double-click to open the image. The high-resolution images didn’t always automatically resize to fit the screen (as they do when you double-click on a photo in Microsoft Windows Explorer and open it Window Photo Viewer), but they looked good on the 12.1-inch, 1280 by 800 pixel display. Really good. Colors were vibrant and accurately rendered--no small trick, as we’ve seen from Android 3.0’s snafus. The file manager remains limited for now--the version I used lacked the ability to do basic file copy functions--but a Google rep promised that functionality will be in place soon. 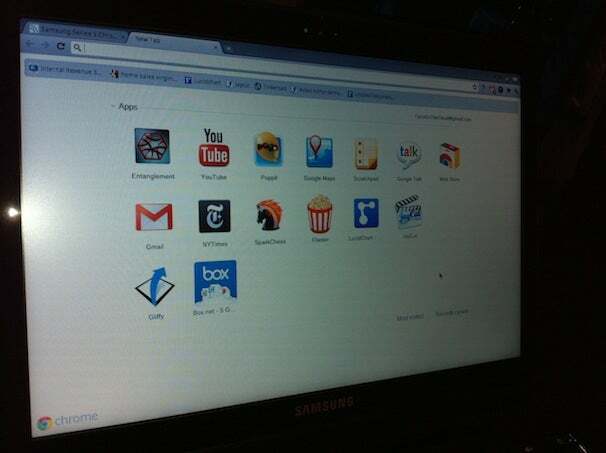 While nosing around the Chrome OS interface, I looked at how apps appear in the Chrome browser (see the image above) I also tried replicating my usual Web browsing experience in the Chromebook’s Chrome browser. (Hrm. I think I just tested how many times one can put Chrome into a sentence.) The usage I was trying to gauge here was the scenario that sees 30-some-odd tabs open simultaneously--and that’s just in one window. While I learned about a couple of interface shortcuts, like jumping to a different tab by pressing the tab number and a key combo, while talking with Google reps about this scenario, I learned that right now, it’s not easy to move among scores of open tabs. Those tabs were reduced down to tiny tabs with just “…” as a tab identifier—and that’s no way to figure out what’s actually on that tab. Considering these tabs will, in the Chrome OS universe, represent your open documents, media files, applications, and Web pages, this is an interface challenge that Google will need to crack, and soon. Google reps said that several approaches are being considered, but nothing has been nailed down as yet. Of course, this is where Chromebook and Chrome OS’s regular updates, currently scheduled for once every six weeks, will come in handy. I’m not convinced that everyone will want, or even need, a Chromebook. But what I saw so far looks to have promise. And with pricing for Samsung’s models starting at $430 for the Wi-Fi version, and $499 for the 3G version, the Chromebok looks set to give standard netbooks and ultralight laptops some new competition. Follow Today @ PCWorld on Twitter or via RSS for the latest tech news and commentary.